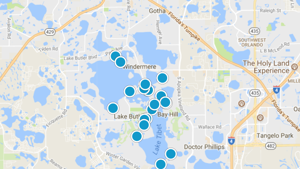 Apopka FL Homes for Sale - is about 20 miles from Orlando FL in Orange County. This community maintains its small town feeling and give its residents access to downtown Orlando and the surrounding towns. Apopka offers Single Family Homes, Condos, and Town Homes in this town. Apopka FL Real Estate is a good entry point for a first time home buyer all the way up to the luxury home owner. There are quiet of few new construction builders currently building brand new homes. Call the Petridis Home Team if you have any questions or if you want to see any of the homes. Errol Club Villas 01 SubDv. Z H Masons Add SubDv. Magnolia Woods At Errol Estate SubDv. Oak Ridge Ph 2 SubDv. Caroline A Abbotts Sub SubDv. Piedmont Lakes Ph 04 SubDv. Piedmont Lakes Ph 03 SubDv. Lovely 2/2 single family home with den. Home has been freshly painted, kitchen remodeled, new carpet. Air conditioner & roof are less than 2 years old. Martin Place Ph 02 SubDv. Bel Aire Hills Unit 3 SubDv. Wekiva Club Ph 02 48 88 SubDv. Errol Oaks Condo 01 SubDv. P L Starbirds Sub SubDv. Walker J B & T E SubDv. Bel Aire Hills Unit 2 SubDv. Votaw Village Ph 02 SubDv. Lake Pleasant Cove A B C D E SubDv. Errol Club Villas 04 SubDv. Courtyards & Coach Homes SubDv. Vineyard Condo Ph 06 SubDv. Rock Spgs Rdg Ph Vii-B SubDv. Wekiwa Hills Second Add SubDv. Robinson S A 02 SubDv. The Milan A Condominium SubDv. Spring Ridge Ph 1 Unit 1 SubDv. Wekiva Run Ph Iii-B SubDv. Robinson & Samuels Add SubDv. Rock Spgs Rdg Ph Vii B SubDv. Arbor Rdg Ph 01 B SubDv. Beautiful lot level cleared and ready for your commercial building. Zoned Commercial (C-1) City of Apopka. Sewer and water to lot. Poe Reserve Ph 2 SubDv. L F Tildens Add SubDv. Estates At Sweetwater Country Club Townhomes SubDv. Wekiva Executive Centre Condo SubDv. Pines Wekiva Sec 01 Ph 02 Tr B SubDv. Piedmont Lakes Ph 4 SubDv.